It's easy to become overwhelmed by the many decisions involved in arranging a funeral. At McGrath Funerals, we have combined our years of experience into simple yet elegant services that allow you to quickly make all the important decisions without unnecessary stress. Our McGrath Funeral Care Packages contain three levels of service that we can provide, whether you are arranging a funeral today or planning for the future. 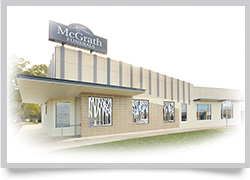 ​McGrath Funerals was established in the Darling Downs region in 1972 and we have been proudly serving our community ever since. We are a 100% Australian family-owned company and accredited members of the Queensland Funeral Directors Association. When you choose McGrath Funerals to serve your family, you are in the hands of understanding professionals, serving you and your loved ones with experience and care.